Brad’s recent comment (Brad, on July 19th, 2008 at 7:25 pm) has prompted me to post some new pictures of my Frog Pond. 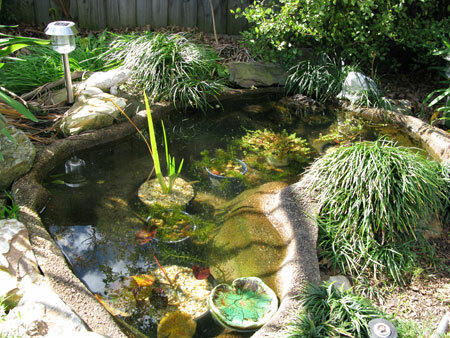 I have only just cleaned out my pond and re-potted all the water plants. A job long past due as it has been two years since the last major service. The bottom was a mass of roots as the water lilies had spilled out of their pots and were anchored in all parts of the pond. New pots and some specialised water lily fertiliser should have them looking their best when the weather warms up. During the clean-up I discovered quite a few tadpoles ( 5 Peron’s Treefrog & 3 Striped Marsh Frog) that have been wintering over. These would have been from late summer spawning and so will complete their development in Spring. 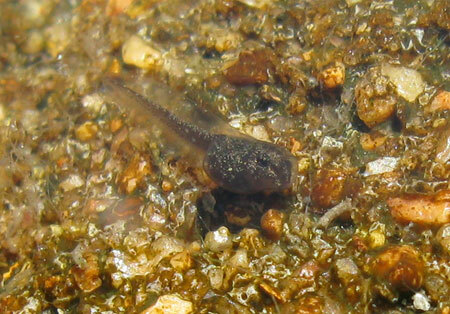 There were also around 20 baby Crinia signifera tadpoles – recently hatched. Crinia seem to call all year round in the backyard – some rain and a couple of sunny days has prompted them to breed. So Brad, yes you just may have tadpoles in your pond too. 2 Yellow Water Lilies – Great for providing cover once established. 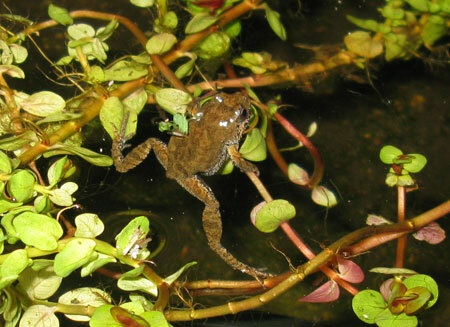 1 Pink Rotala – Frogs love to sit in the foliage when calling from the pond. 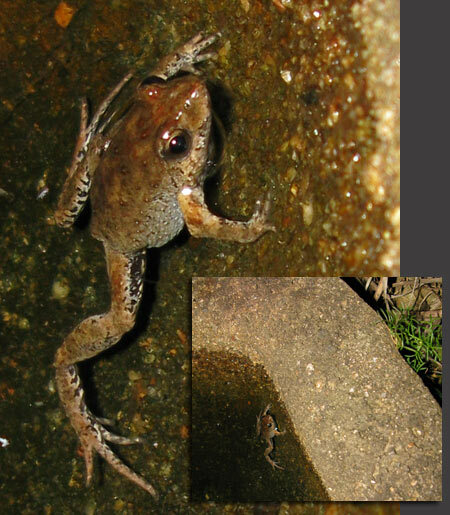 Elodea – Tadpoles love to munch on elodea and frogs will lay their eggs around it. The Crinia are singing their hearts out again tonight. I braved the chilly night air to see if I could capture them with the camera. I would say there were at least 6 calling from either around the pond edge or the plants. Some were camera shy and swam away or scurried back into the rock crevices as I approached. I didn’t make it. It is one of those fibreglass ponds with a pebble finish available from garden centres. Well, Spring is just about here and the frog chorus from the pond is getting louder every night so I’m sure all sorts of critters will be about in the coming weeks! how deep are the pots in pond? did you plant in regular potting soil? thanks.. Some of the pots have their rims just under the water. The water is so clear in that picture it is difficult to tell. These pots have been placed on old bricks so that the plants do not sit too deep. The pot containing the water lily is sitting right on the bottom of the pond. Regular potting soil tends to float away and contains fertilisers. I usually dig up some soil from the garden ( will mix with a bit of old potting mix when can’t find enough soil). I put a little bit of paper in the base of the pot and a layer of aquarium gravel on top to help stop the soil going everywhere. I also sit the pots in an old tub full of water for a day to let things settle before putting them in the pond. If you have eggs in your pond then the frogs must be happy with it as is. 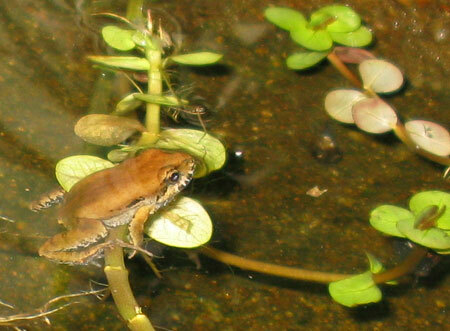 Many frogs prefer still water for breeding so not sure about how the waterfall will go. So long as the water is not overly agitated I guess it would be fine.